"I worked with Jack at Van Mall Lodge,he was a hard..."
"My husband (Paul Bellows) and I got to know Jack at..."
"Uncle Jack was a wonderful guy, always willing to give you..."
"Sorry to lose a Old friend since Jr Hi"
Jack O. English quietly passed away due to natural causes on December 8, 2015 at age 87. Jack will be lovingly remembered by his wife of 64 years, Marjorie, their children, Gary (Karen), Russell, and Mark; grandchildren, Forrest and Abby; extended family; and uncountable friends. He was born in Wymore, NE and moved to Vancouver, WA at age 16. Jack and Marjorie were married on January 6, 1951. He served in Korea in 1951-1952. Jack worked for Alcoa Aluminum from 1944 to 1977. He was signed as semi-pro baseball team pitcher. 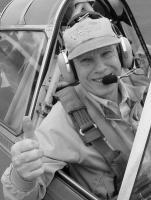 Jack learned to fly at Evergreen Airport after retirement. He volunteered to be a clown at the annual Alcoa Christmas Parties, was a Boy Scout troop leader and took scouts on trips into the N. Fork of Lewis River Valley before the existing Swift Reservoir was built. He was a record holding bowler at Vancouver Lanes, a great golfer, played pool with his sons, brothers and nephews, and was a brilliant horseshoe player. Funeral services will be at First Congregational Church, 1220 NE 68th St., Vancouver, WA, Sun., Dec. 20th at 1p.m. A celebration of his life will be held immediately following the services with a potluck reception. Please sign Jack's Guest Book at www.columbian.com/obits.